I talked about the World Harbors line when I covered their Sweet 'n Sour Sauce a few weeks back. This week, I'm taking a look at their Mexican Style Fajita Sauce and Marinade. 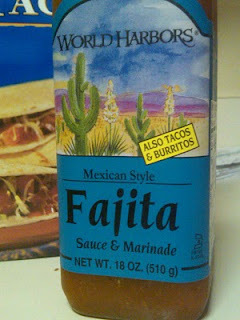 I primarily use this fajita sauce on enchiladas, burritos and the occasional taco. Actually, just about the only thing I haven't juiced with it are fajitas (but I'm sure they would be great). Like most World Harbors sauces, the fajita sauce contains vinegar, so it can be used as a marinade. Note: I'm also very impressed with the label's artistic rendering of what must be Mexico.